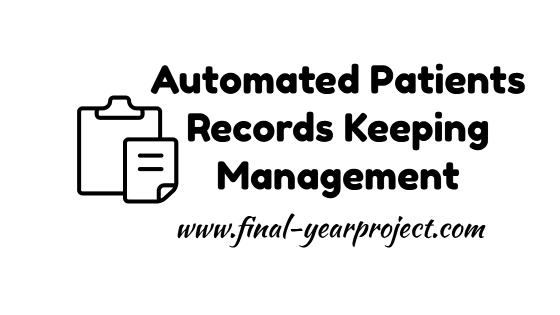 This is Computer Science project on an "automated patients records keeping management" and this project will be in the area of Management Information Systems (MIS). An Information System (IS) is a set of interrelated components that gather (or retrieve), process, store and disseminates information to support decision making and control in an organization. The overall objective of study was to develop a management information system for keeping records of patients in hospitals. You can also Subscribe to FINAL YEAR PROJECT'S by Email for more such projects and seminar. A Management Information System (MIS) is commonly a computer based system, that collects, processes data (information) and provides it to managers at all tiers that use it for decision making, planning, program implementation, and is comprised of all the components that collect manage and disseminate records or information. i. To identify the system requirements by studying the current system. ii. To design a management information system for keeping records of patients in Doctor’s Medicare Clinic. iii. To implement the developed management information system. iv. To test and validate the developed system by use of the case study. Many health units use manual systems of data management with no customized software application to speed up data processing; this has led to time wastage in locating of different documents and a lot of paper work in the offices. A customized management information system will help the health unit in improving the data security, easy record access, and reduction on stationary costs among others. In addition, patients will be able to know their medication details, how long their admission will take, it will also enable the management to know who are currently admitted, which rooms are available, and the available drugs and this will be done at a faster rate than before and errors will be minimized. This propose project is limited to only patient records and it does not accommodate the rest of the data about the clinic or even the staff data. And also the system is not online, the user can only access it locally, it does not favor remote users. Though in future development it can be enhanced. Use this report for your reference only and all credit goes to author of the project.